Mitch Zeller, the Director of the Center for Tobacco Products at the U.S. Food and Drug Administration, recently published an article with six questions about the future of nicotine regulation. As he has taken the time to put some questions and expressed interest in the answers, here are mine. I have spent most effort on his sixth question, the one about youth. Mitch Zeller’s six questions are in bold below and my responses follow each. I also address a further three questions posed by Ken Warner in the same series. 1.How comfortable are we with long-term, or possibly permanent, use of less harmful nicotine delivery mechanisms by adults, if they help keep currently addicted smokers from relapsing to combustible tobacco products? More than comfortable, I’d be very content. It may also improve their welfare and life satisfaction (in the same way a glass of wine or two improves mine), as well as protect against relapse. We have yet to even start the conversation about the possible therapeutic value of nicotine in mitigating the effects of neurodegenerative diseases (See Paul Newhouse presentation at GFN). The main basis for public health interest in tobacco/nicotine is in the the collateral health consequences of consuming nicotine via inhalation of smoke from combustible tobacco products. It is not about the use of a relatively benign recreational drug that does not cause significant harm, intoxication, violence, accidents or various forms of vulnerability. 2. How much weight should be placed on diminished interest in quitting nicotine altogether? Very little. Diminished interested in quitting should be expected if the cost to a user falls: in this case the non-monetised health and welfare costs associated with being a smoker. If there was a choice between having 20% of a community smoking for the long term or 10% smoking and 30% vaping (i.e. half the smoking and twice the nicotine use) I would definitively choose the latter (see Rethinking Nicotine quiz for more like this). Because the health benefits of complete cessation of nicotine compared to continued non-combustible nicotine use are so small, then it will be extremely difficult on cost-effectiveness grounds to justify allocating public resources to ‘nicotine cessation’ other than through smoking cessation. 3. Given the potential health impacts of dual use of tobacco, how acceptable is a short period of dual use while transitioning to less harmful nicotine-containing products? It is not only acceptable but potentially desirable and necessary as a transition from exclusive smoking to exclusive vaping for some users. It may be beneficial in guarding against immediate failure and relapse if the behaviour change required is too abrupt. The question of ‘acceptability’ raises the question of acceptable to whom? And what is supposed to happen if this is deemed ‘unacceptable’? We should stop thinking as public health or regulators as all-powerful controllers of human behaviours. The aim should be to create a ‘choice architecture’ that supports informed consumer behaviour and facilitates switching to lower risk behaviours in the user’s own interest. “Dual use” is not an adequate characterisation of any specific behaviour. If someone smokes once a week and vapes the rest of the time, they are a dual user. But they are also a dual user if they smoke all the time and vape occasionally. The behaviours and risks are obviously completely different in every respect. If they are doing ‘dual use’ as an alternative to exclusive smoking, then it is somewhat beneficial in two ways: (1) reduced exposure to some toxins; (2) may evolve into a preponderance of vaping if users are making a transition. There isn’t much evidence that dual use prevents quitting. 5. 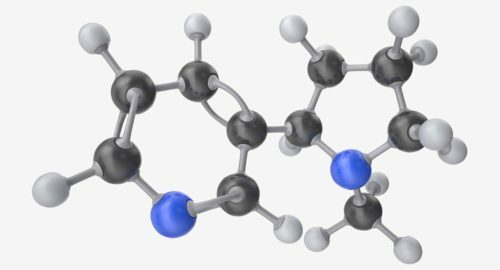 Can we revise labeling and indications for medicinal nicotine to increase quitting? Yes, nicotine replacement therapies should have broader harm-reduction indications and make clear this type of use is desirable – though some care is need in translating the findings of trials to the impact of over-the-counter sales. But, most importantly, improving the options for medicinal treatments should NOT be an alternative to having a vibrant market in consumer alternatives to smoking. The medical paradigm is “illness > treatment > cure”, whereas the consumer paradigm is “smoking > less harmful pleasure > switch”. These are fundamentally different in motivation and appeal. 6. How might youth initiation be affected by the availability of different nicotine-containing products and how should we account for youth uptake of these products? We should worry less about youth initiation of vaping and more about youth and adult smoking. First, youth vaping should be put in context with other youth risk behaviours. See Youth Risk Behavior Surveillance reporting on alcohol, drugs, violence, suicidal intent, sexual behavioural risks etc. It makes quite bleak reading. Youth nicotine use or vaping is not desirable, to be condoned or recommended. But in context of all youth risk behaviours, it is a relatively minor risk to young people with no immediate consequences and only minor impacts if the behaviour persists for many years. Other prominent risks can have immediate and fatal consequences or cause a lifetime of blight. If we care about young people’s well-being, these risks should be the primary focus, not just what US Federal agencies happen to have money for. Second, there is no credible evidence of a material gateway effect from vaping to smoking – so the harms of smoking cannot be attributed to vaping via this mechanism. Without such a mechanism, the harms, if any, are likely to be minor. It is unlikely that there would be a causal gateway effect, given that vaping has many advantages over smoking. There, of course, are many studies and almost as many wild claims, but all inevitably fail to address confounding and the problem of common liability. The reasons why people smoke are similar to the reasons they vape. Third, youth vaping embodies at least two distinct behaviours, substance use and experimental. We should carefully distinguish between heavier substance use (primarily daily users growing dependent on nicotine) and social, experimental or frivolous use (e.g. blowing big clouds at parties) – by conflating the two, we risk overstating the probability and dissipating focus on those at risk. It is important to delineate these behaviours and be clear about who is doing which. 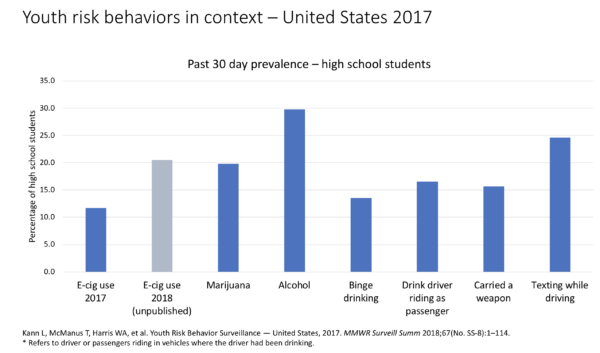 For example a large increase in frivolous use should not concern us that much, and should not be a reason to inflict harms on adults due to an excessive regulatory response. If more frequent use is increasing, then we should ask whether this is among smokers, who may be starting to use this as an alternative to smoking. A further behaviour may be what we know as a ‘fad’ – a transient phenomenon, often arbitrary or inexplicable in its origins. The danger of fads is an excessive regulatory reaction which has unintended consequences that are suffered long after the fad has itself dissipated. Even if kids are using ENDS instead of cigarettes — and that migration in part accounts for the decline in youth cigarette use — that’s still not an acceptable trade. Parents who see their children using e-cigs and say, “well at least my child isn’t smoking,” should take no comfort. Yes, they should take comfort, though given the widespread misperceptions about nicotine and vaping, few will. The corollary of this position is that FDA is indifferent to whether young people smoke or vape and that it would be willing to take action that harms young people who are or likely to become nicotine users to prevent other young people becoming nicotine users. That runs counter to the public health ethos that is supposed to guide FDA. The debate over vaping is often positioned as a conflict between the welfare of adults and detriment to kids. This is a false dichotomy – there are trade-offs within the teenage population. Fifth, parental smoking is an important risk factor for youth smoking and adult smoking is a driver of youth initiation. The adult and youth populations cannot be conveniently separated, as adult behaviours are risk factors for youth smoking. This happens at the large scale (young people are often trying to emulate adults they look up to) but also most important within the family. It is of course a leap of logic to claim that stopping parental smoking will stop youth smoking, but it is highly unlikely that stopping parental smoking would have no beneficial effect. At least those who are prepared to give less weight to the welfare of adult smokers should consider the effect of parental role-modelling on youth smoking initiation. Sixth, real harm arises from the smoking through the life course, not from being a teenage smoker or vaper. Serious smoking-related harms accumulate over decades. We have to recognise that teenagers become adults and that their interests over their whole life course are what matters and should be our concern. Again we cannot conveniently separate youth and adults into two distinct population groups for which we can determine different degrees of concern. Almost all premature mortality risk is avoided if a smoker quits by age 35 and so what happened to a teenage nicotine user over the first two decades of use should be our concern. In this context, we should recognise that the means to switch to vaping later in life is a benefit (it has “options value”) to young people today, including those who are committed smokers from an early age and hence at greatest risk over the longer term. In many ways, we should focus our concern on adults who are turning 40 as smokers, and our concern for teenagers should be to the extent that their experiences contribute to that. But the means to quit smoking and switch to vaping before 40 greatly improves the life chances of adolescent smokers. The following stylised examples suggest a more thoughtful analysis of youth smoking and vaping is required. Youth who would have never smoked takes up vaping = minor detriment (depending on how long it persists). Youth who would never have smoked starts smoking and this is caused by vaping, but does not revert back to vaping or quit before age 35 = significant detriment. This is the one that does material harm: no evidence exists that this is likely to be a substantial pathway. 1. Will FDA develop sensible and affordable MRTP and PMTA procedures (or standards) that will make it feasible for smaller companies to seek approval? To date there is no indication that they are tackling this critically important component of their comprehensive regulatory plan. Whatever the intent, the effect of the system as it is will be to function as a starkly asymmetric regulatory protection of the cigarette trade (cigarettes have been given a gigantic pass by the grandfathering provisions of the 2009 Tobacco Control Act) and to distort the market to favour those companies capable of cross-subsidising their vaping or other reduced risk businesses – the tobacco majors. The current arrangements have a profoundly distorting effect on the market that works against the better, lower risk nicotine products, and in favour of cigarettes and the vaping products of tobacco companies. Why does anyone think that is a good idea? 2. How will FDA withstand enormous political pressures opposing both nicotine reduction and support of risk reduced products? FDA’s inability thus far to ban menthol in cigarettes does not inspire confidence that the agency will be able to achieve much more radical policies. Menthol increases smoking initiation and nicotine dependence and decreases cessation. It is true that FDA has achieved very little (please suggest achievements) with respect to the most dangerous products, cigarettes even though these have been under its jurisdiction for since 2009. There is every reason to doubt FDA’s political, legal and intellectual capability to deliver an intervention so gigantic and complex as mandated nicotine reduction, which intervenes in the personal behaviours of 35 million Americans. So many affected stakeholders are outside FDA’s direct competence (farmers, state treasuries, law enforcement etc) and the unintended consequences are potentially enormous. The political will to make bold acts is perhaps best calibrated by the level of taxation on cigarettes, which is low by international standards. Fortunately, FDA only needs to withstand the pressure opposing the second of these – the anti-vaping crypto-prohibitionists. The former is unnecessary. This should be easy given millions of Americans actually want these products even though there is much misinformation about them. No-one really benefits from nicotine reduction (or if they do, it would be the consequences of coercion) and millions will see it as Federal over-reach. With good enough alternatives and innovation-friendly regulation, the process of creative destruction will do more heavy lifting than nicotine reduction in the bringing about the obsolescence of smoking. If FDA insists on actually doing nicotine reduction, rather than retaining it as an ‘agency threat’ as we recommend, then it will need to resist both forms of opposition – the former cannot work without the latter. Whether it tries to secure its reduced nicotine rule or not, it is a prerequisite to ensure the availability of a diverse range of reduced risk products – as argued in Attorney General Miller’s response to the reduced nicotine standard ANPRM. Because expanding to all combustibles greatly expands the scope of the rule, the range of interested and opposed parties, the likelihood for unintended consequences and illicit trade (e.g. hand rolling tobacco), and hardly any research $$ have been expended on non-cigarettes. Recall, FDA could barely cope with the large cigar lobby or banning menthol cigarettes. So expanding the scope – though impeccably logical on practical grounds – makes the whole enterprise even more likely to collapse. Warner is right to highlight the inconsistency in allowing these forms of combustible product, but draws the wrong conclusion: the vast scope creep required to reduce nicotine in all combustible products is a further reason why reduced nicotine rule-making will fail. Note, in fairness, FDA did ask about extending scope in its ANPRM. Excellent read. So refreshing to see plain common sense in print. Excellent, Clive. This is exactly what I can use when going in to talk to the Ministry of Commerce about lifting the ban of ecig here in Thailand at the end of this month. Great write-up, but I have an honest question-what is so alarming about youth nicotine use, and yes, even habitual use, given what we know about the drug? By itself it is as innocuous as caffeine; as you mentioned, its potential negative externalities pale in comparison to alcohol or marijuana use, both drugs more commonly consumed by youth. Is there any evidence for the “harm to adolescent brains” theory? To my knowledge, there is none for human brains. We keep insisting that youth should be barred from any and all nicotine use sans smoking, but I see no good reason to, anymore than there is a reason to ban youth from drinking coffee. If I’m missing something, I would like to know. Of course I’m aware of how politically incorrect it is to even suggest this at all, so I ask this question in context of your post. The alarm over youth experimentation with vaping seems completely overblown, and not just because of Gottlieb’s histrionics about a youth vaping “epidemic”, but because of everything we currently know about nicotine use isolated from cigarette smoking. Yeah, I’m still trying to wrap my head around this as well. I understand not wanting teens to get addicted to a substance, yet as far as science has shown, nicotine is no worse for you that caffeine, just slightly more addictive. And vaping as a method of consumption has been shown time and time again to be relatively harmless. Surely it’s better that teens try nicotine out through e-cigarette usage rather than traditional usage. I’m not sure why people are so deadset on demonizing nicotine. You sent this to him, I hope? What about that FDA study that shows NICOTINE IS NOT ADDICTIVE WITHOUT SMOKE? It was a public announcement — BY THE FDA. CASAA might have a bookmark for it. Tonight I’ll rummage around in my old bookmarks to see if I have it. I strongly agree with Clive’s answers to Mitch Zeller’s six questions, and his focus on question 6. Ironically or not, since Zeller became a GSK lobbyist in 2002, he has also agreed with Clive’s answers to Mitch’s first four questions if they refer to FDA approved NRT products, but has vehemently disagreed with Clive’s answers if they refer to smokeless tobacco products, and subsequently vapor products. My answer to Mitch’s question 6 is that FDA should acknowledge that “past 30 day use” of a vapor product by teens is an inaccurate and unreliable statistic for assessing nicotine dependence and actual teen vaping trends. Other far more important data from the NYTS (and other DHHS teen surveys) thoroughly refute and disprove the FDA’s recent claim that teen vaping is an “epidemic” and DHHS’s longstanding claim (since 2014) that vaping and nicotine have been addicting another generation of teens. – Half of 6th-12th graders who ever used an e-cig reported vaping THC/marijuana, up from 38% in 2016. – 41.5% of 6th-12th graders who vaped in the past 30 days did so just 1-2 days, and 61% vaped 1-5 days. – Just 1.24% of nonsmoking 9th-12th graders (mostly exsmokers) vaped on 20+ of past 30 days, while the 2015 NYTS found 0.3% of never smoking 6th-12th graders vaped 20+ of past 30 days. – 18.5% of 9th-12th graders who used an e-cig in the past 30 days were 18+ adults (not youth, as DHHS calls them). – 45% of 9th-12th graders who vaped 20+ of past 30 days were 12th graders (most who were 18+). – Just 1.1% of 6th-12th graders vaped daily, and just 1.6% vaped 20+ of the past 30 days. – Ever use of e-cigarettes by 6th-12th graders declined from 26.6% in 2015 to 21.1% in 2017. – Past 30 day e-cigarette use by 6th-12th graders declined from 11.2% in 2015 to 8.2% in 2017. – Youth access to e-cigarettes declined significantly from 2015 to 2017. – Since 2011, cigarette smoking among 6th-12th graders has sharply declined, including daily smoking (-64%), frequent smoking (-63%), past 30 day smoking (-52%), ever smoking (-43%). Per Ken Warner’s 1st question, since 2014 I’ve pointed out that no more than six companies in the world have the massive financial and human resources needed to submit PMTA and MRTP applications to FDA for vapor products (that FDA would even consider reviewing). Even if FDA reduced the $100+ Million cost (to submit PMTA and MRTP applications for a vapor product to FDA) by 90%, fewer than 1% of the several thousand vapor manufacturers would submit PMTA and MRTP applications. Finally, FDA’s proposed nicotine cigarette ban (er standard) cannot reduce cigarette smoking as FDA has repeatedly claimed (via millions of smokers switching to vapor or smokeless tobacco products) unless the FDA repeals/rescinds its Deeming Rule and rescinds its proposed smokeless tobacco ban (er standard). Very nice passages. Those people might actually learn some welfare economics (i.e., the science of how real people actually act and what they care about) if they ever read what you said. spot on. The whole “issue” hinges around the question of whether or not nicotine is a “problem” when in the absence of smoke. vaping industry is what consumers want. The thing that should be banned is the constant meddling in the choices we make. And the deceit that goes with it!